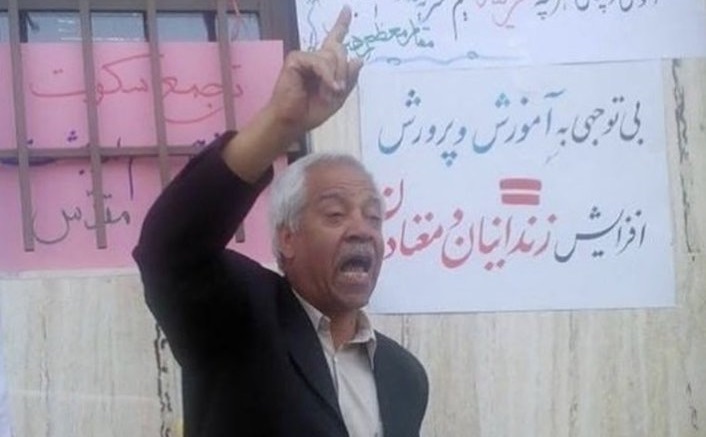 On Tuesday, Hashem Khastar, a local union leader who represents teachers in Razavi Khorasan province in north-eastern Iran, disappeared from his family’s farm outside of Mashhad. His wife and friends tried to call him, but his phone was turned off. His car was left near the farm. The following day his wife, Sadigheh Maleki, called authorities, to ask for information about her husband. On Wednesday, she received a call from a member of the Islamic Revolutionary Guard Corps (IRGC), who said that Khastar had been hospitalized for mental illness. Maleki went to Eben’e Sina Hospital in Mashhad to find her husband, but security forces were blocking anyone from going near the area where he was being held. Khastar has no history of mental illness, nor does he has any physical ailments other than high blood pressure, which is common for a man of his age. Khastar is, however, a retired teacher who has been a vocal critic of the regime. He recently participated in peaceful protests in support of better working conditions for teachers. Khastar served prison time for his education activism in the past, most recently from 2009 to 2011. He has openly criticized Iran’s educational system and the regime as a whole, going so far as to call regime Supreme Leader Ali Khamenei a dictator. After the two-day teacher’s strike earlier this week, Khastar wrote a letter criticizing the regime. Khastar wrote that Khamenei was “the root of the corruption and all the problems” and must be held accountable. Authorities abducted Khastar without a warrant and hospitalized him without evidence of any physical or mental illness. It is unclear at this point how Khastar ended up in a psychiatric facility. He could have possibly been injured during his arrest or authorities may have locked him in a psychiatric facility in order to sedate him. It does seem clear that Khastar was hospitalized for his activism and not for his health. Khastar’s message echoes that of the MEK, which has been fighting to overthrow the corrupt and brutal theocracy and restore democracy to Iran. The MEK’s Resistance Units have worked with teachers to organize protests across the country to improve working conditions for teachers and free those who have been imprisoned for their activism. 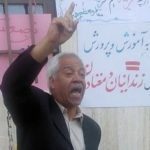 Iran’s teachers are demanding that the authorities provide further information about Khastar. They have further renounced the regime for its role in his abdication and its treatment of the retired teacher.